Why Did Nokia Burn Cash in Q2? Nokia recently announced that it had acquired Siemens' 50% stake in Nokia-Siemens Networks at a fairly low valuation. The markets cheered the move as they saw it as a precursor to a sale of Nokia's under-performing handset division. The announcement also revealed that Nokia surprisingly burned roughly €300-€800 million in Q2 (before the NSN acquisition). Let's take a look at why this may have occurred. The chart above compares the operating margin of Nokia's devices & services (both feature phones & smartphones) division with sequential cash addition. 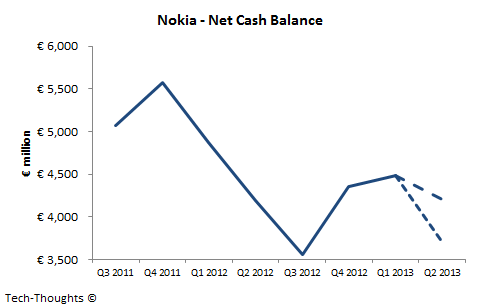 As we can clearly see, the profitability of the handset division is the primary driver of Nokia's cash position. The only deviation from this pattern occurred in Q1 2012, when Nokia-Siemens Networks declared an operating loss over €1 billion. NSN has been profitable over the last few quarters and Nokia's HERE division accounts for a minimal portion of revenues & profits. 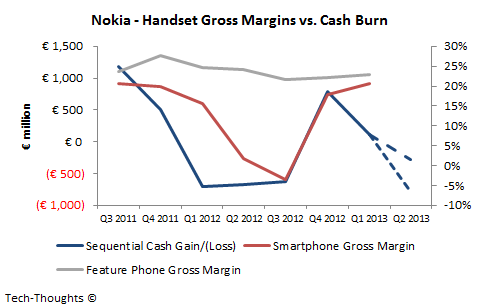 This implies that Nokia's handset division has been the primary cause of the cash burn projected in Q2. The chart above compares Nokia's sequential cash addition with gross margins on Nokia's feature phone & smartphone portfolio. Gross margins on Nokia's feature phone portfolio have remained relatively stable, even with the unexpected shipment collapse in Q1. 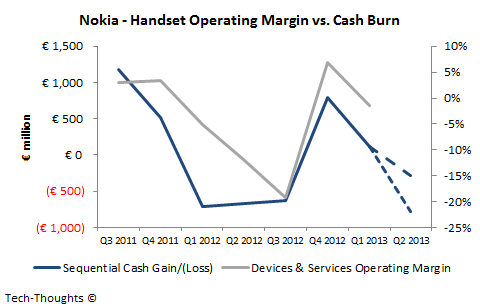 However, gross margins on Nokia's smartphone portfolio seem to be highly correlated with the cash position. Q1 was the lone outlier, where lower feature phone shipments and relatively higher operating expenses impacted cash addition. It is important to understand that Nokia did not burn cash in Q1 even though the feature phone portfolio's performance was extremely poor. Therefore, unless there were significant restructuring costs involved (unlikely at this point), a cash burn could only happen in one of two cases - 1) Nokia's feature phone shipments have further collapsed from already low Q1 levels, or 2) Nokia's feature phone business continues to be in bad shape and Nokia's smartphone business has also deteriorated. A further collapse of Nokia's feature phone business is certainly a possibility as low-end competition from Android vendors has been intensifying and Nokia's "high-end" Asha 501 model only started shipping in June. Having said this, there are negative signs for Nokia's smartphone business as well. As I had previously showed, Nokia's Windows Phone inventory was above normal levels in Q1, which could prevent Nokia from hitting their targeted shipment level of 7.1 million in this quarter. Also, there have been rumors of higher than normal return rates for Nokia's Lumia models, which could have had a ripple effect on Q2 shipments. We will have to wait for Nokia's Q2 results announcement later this month to confirm these hypotheses.